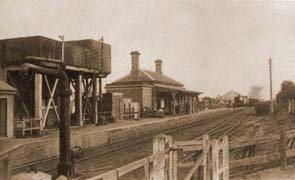 Scone Railway Station early 1900's. Note water tanks and pumps which supplied steam trains. any means is strictly prohibited. The early explorers would be astounded if they knew that Scone was now the horse capital of Australia, and an important centre for dairying and recreation. In the 1820’s, land grants began in the region, and the way over the range was mapped out. The colony had been running out of good quality land for both the increasing numbers of flocks and herds, and to grow foodstuffs for the expanding population. This push up the Valley led to village reserves being mapped out by surveyors, with roads and commons being included along British lines. Scone was one of the sites marked out for such a village, and these were generally placed at points where men and their stock could obtain food, water and accommodation at the end of each day's traveling. 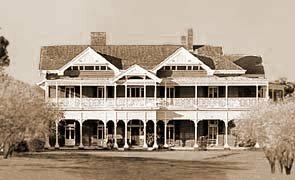 With Scone being situated between Muswellbrook and Murrurundi, it was a convenient staging post for travelers along the Great North Road - now the New England Highway - and it had plentiful sources of fresh water. The first land grant was to Francis Little in 1825, at Kingdon Ponds, near Dartbrook, and he called it “Invermein”. It was well-watered by a number of lagoons and for many years the district was known as Invermein. He used his house as the venue for court proceedings in the area, when he was subsequently made a magistrate. Little made considerable contributions to the development of the area and was also one of the earliest settlers to experiment with wine-growing in the Hunter. The next grantee to leave his mark was Thomas Potter Macqueen, MP. In 1825, the surveyor, Henry Dangar, was accompanied to the Upper Hunter by Peter Macintyre who had been sent out from England to establish a grant of land for this gentleman. The acreage ultimately amounted to 20,000 acres, and it took up all the rich river flats between Aberdeen and Lake Glenbawn, and up to Brush Hill. It was named Segenhoe after the Macqueen’s family estates in Bedfordshire. He dispatched two sailing ships laden with merino sheep, shepherds, sheep dogs, cattle and horses, as well as assorted agricultural implements. However, it wasn't until 1834 that Macqueen and his wife arrived to take up residence there. A story circulated that the eccentric Mrs Macqueen was in the habit of bathing in warm cow's milk, which was later distributed to the convict laborers! Her bath was reputed to be pure carved marble, which had been especially imported from Italy for her exclusive use! At Macqueen’s request, an adjoining village reserve was set aside adjoining Segenhoe to the south, and named in honor of the Earl of Aberdeen. Macqueen was known for his humane treatment of his assigned convicts (some of whose families he brought out from England at his own expense), but this made him very unpopular with his neighbours. As the complaints mounted, Governor Bourke decided to pay Macqueen a visit. He was greeted by the Union Jack flying at full mast over Segenhoe as he rode in, and was also welcomed by a highly unusual guard of honor. This was formed by the neighbouring land-holders on horseback, Macqueen's private army, the convicts in freshly-laundered uniforms, and a tribe of Aborigines in full war-paint. This display, another of Macqueen's extravagances, did not go down particularly well with his creditors in England, when news inevitably reached them. At this point his wife, perhaps seeing some financial difficulties ahead, left for Sydney and another man. In 1837, Potter Macqueen was a broken man, so he sold Segenhoe, and returned alone to England. St Aubins Homestead built in the late 1800's by Bakewells. 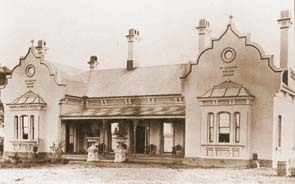 The Belltrees Homestead, built in 1907. Another important player, was Captain William Dumaresq, who had developed an estate of 13,000 acres on the southern side of today’s Scone, and which he called St Aubins. His brother Henry established an equally impressive property at Muswellbrook called St Helliers. The St Aubins homestead we know today, was built in the late 1800’s by Bakewells, who establised extensive brickworks in the area. The earlier St Aubins of Dumaresq’s time, was further south. The St Aubins Arms was a hotel built on part of his former holdings, and this was associated for many years with the Johnston and Nowland families. The area was given the name Scone, after a Scottish settler named Hugh Cameron petitioned the Surveyor-General, Thomas Mitchell, that the town be named Scone after the Stone of Scone where the old Scottish kings were crowned. Subsequently, the parish became known as Strathearn, and the town became Scone. It was gazetted a village in September 1837, and the reserved Crown Land around it was sold to Captain William Dumaresq, who added it to his adjoining property of St Aubins, portions of which later became part of the town. 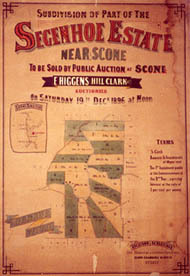 In 1888, Scone was incorporated as a municipality. Belltrees also plays an important part in the history of the Upper Hunter. It has been associated with the White family for many years, and a picture of it can be seen here. It comprises land granted in 1831 to Hamilton Collins Sempill and further grants to W.C.Wentworth and James White. Scone is a pleasant town in the Upper Hunter, 283 km north of Sydney and 26km north of Muswellbrook. It is slightly above sea-level and is the commercial and administrative centre of a growing pastoral, agricultural and dairying region. It is an important stock-selling centre, and is noted for its horse and cattle properties. 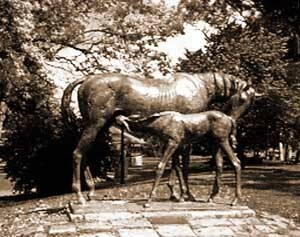 It claims to be the second-largest horse breeding area in the world, after Kentucky in the United States. Every May it hosts the ten-day Scone Horse Festival and there are street parades, a rodeo, stock sales, an air-show, race meetings and entertainment. There is also the six-week Hunter Horse Expo held in September-October, and a new hi-tech racecourse with an Equine Research Centre. It has an airport, polo grounds, well-equipped shopping centre, hotels, motels, and an historical museum. Just out of town, there is Lake Glenbawn, where the upper reaches of the Hunter were dammed in the late 1950’s, after disastrous floods had swept through the area. It is now an important recreation area, and interesting to visit. Wee Waa Werris Creek Early Expeditions Nowland Bros.